Every day millions of people post pictures on social media, but friends of Derek Medina couldn't believe their eyes when they saw his latest Facebook post. Was that really a picture of his dead wife? Crime Watch Daily has the story behind the story that made headlines around the world. Jennifer Alfonso was everybody's friend. "Jennifer was very kind and caring, her heart was just so pure," said Daysi Fernandez, Jennifer Alfonso's best friend. "It allowed people to be vulnerable and open with her, because she was such a good person." Jennifer, a single mom of a young daughter, met Derek Medina while waiting tables at Denny's in South Miami. 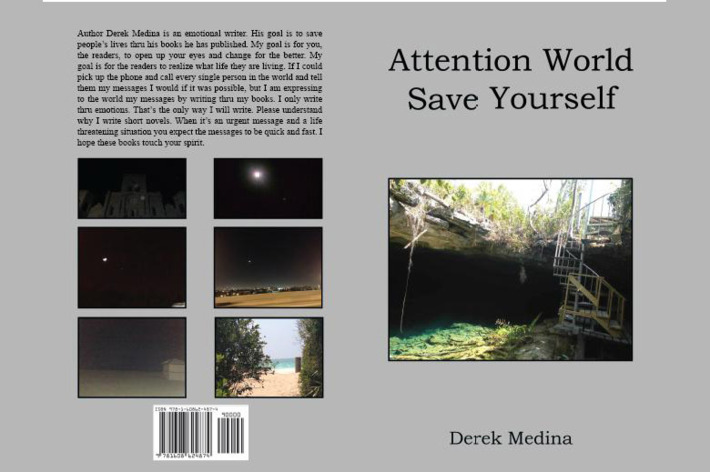 "Derek Medina was a real Miami character, someone who was really a narcissist, someone who was really self-involved," said David Ovalle, a crime and courts reporter with the Miami Herald. Derek is someone who fancied himself a jack of all trades. He was a writer who wrote a series of self-published e-books with catchy titles like "How I Saved Someone's Life and Marriage and Family Problems Thru Communication," and "If the World Ended Today How Would You React to Saving the World or Helping the World or Would it All be Over for You." In addition to writing, he was an amateur boxer and also an aspiring actor. "He was telling everybody that's he's an artist, that he's a movie star," said Daysi Fernandez. But Derek wasn't finding much success in Hollywood. So he tried his luck on a smaller screen, often posting clips of himself on social media. One of their common interests was the supernatural. "Her and Derek used to go see ghost tours in different cities," said reporter David Ovalle. Reportedly Derek even put cameras up in the house, hoping to catch their own spirit or two. "They were sort of interested in things outside of the mainstream, but they made a really unique pair," said Ovalle. Unique, and also volatile; they fought a lot. "They would just fight about silly things, and he would break up with her often, he would throw her things to the side and insult her and then ignore her," said Fernandez. "Jen used to call them 'Mexican stand-offs.' She would surrender often. She loved him." But love wouldn't be enough. Derek eventually filed for divorce. "So Jennifer moved into an apartment and she was doing very well, and then, he started contacting her again," said Fernandez. Whatever he said or did, worked. "The very next day they were getting married at the courthouse. The very next day," said Daysi Fernandez. So a second ride on the marriage-go-round. But the relationship was as tumultuous as ever. "He was really like sick in the head," said Fernandez. "He would tell her things to make her sad or to scare her." "'I'm gonna stay at Denny's with a gun outside and see if he's gonna [----] with me,'" said Fernandez. "And we would tell Jennifer, 'Hey, he's a little crazy, like, he's gonna kill you.' And she would just look at us and laugh." There was nothing funny about what was about to come. Early on the hot summer morning of August 8, 2013, Jennifer was fuming. "She had asked Derek to wake her up, and Derek didn't, so she was upset," said David Ovalle. The argument starts in their bedroom. "She started throwing things at him, just sort of like a typical type of fight that they would have," said Ovalle. After that, Jennifer went downstairs, reportedly to make pancakes for her 10-year-old daughter, who was still up in her room. The surveillance camera in the house shows Jennifer in the kitchen. Twenty-seven minutes later, Derek appears. "Eventually Derek follows her down there. They continue going at it, and she actually starts hitting him in the chest. And he walks away," said Ovalle. Back upstairs to his bedroom. Moments later Derek comes back down to the kitchen, and this time he is not empty-handed. "When Derek comes downstairs he has his gun with him," said Ovalle. Reportedly Jennifer grabs a knife to defend herself, but she won't have it for long. "Derek disarms her of the knife and puts the knife back in the drawer," said Ovalle. Then seconds later, Derek empties his gun, shooting an unarmed Jennifer eight times. "In full view of the camera, you just see this swirl of gunpowder, and it really was a chilling bit of footage," said David Ovalle. As the blizzard settles, Derek calmly walks away. He puts his gun back in the closet, then tells Jennifer's daughter to stay in her room. "No regard to the fact that he just shot her mother dead and she's lying on the kitchen floor," said Ovalle. Derek goes back to the kitchen, this time, with his phone in hand. But he's not going to call for help. "When I saw it and then I realized it was real -- I just can't believe it," said Daysi Fernandez. Warning: Some of the images you are about to see are disturbing. The chilling crime is caught on their home-surveillance video. "It showed him coming in, arguing with Jennifer, it showed him leaving and then re-engaging, and we know that he's shooting at her," said Miami Herald reporter David Ovalle. Moments later the video shows Derek looking down at his phone as he walks back to the kitchen. He stands there for a minute then walks away, his phone still aglow. After one more perverted peek at her, another camera captures him coolly walking out the front door, zipping up his hoodie and locking Jennifer's bullet-riddled body inside with her 10-year-old daughter. "I woke up to a whole bunch of messages and calls," said Daysi Fernandez, Jennifer's best friend. In one of those text messages, an incredibly disturbing photo: a photo of Jennifer on the floor of her kitchen, slumped back, bloodied and seemingly dead. But is she? "I thought it was a joke," said Fernandez. "I thought that Jen was really playing some role in 'Walking Dead' or something. And I'm like 'All right, whatever, dude, if that makes you happy.'" But this is not one of the occult-loving couple's zombie pranks -- this is dead serious. Within minutes of murdering Jennifer in cold blood, Derek morbidly took a photo of her dead body, then posted the gruesome photo on his Facebook page, and on hers. "The post with it went something like 'Rest in peace Jennifer,'" said Fernandez. That wasn't all. Evidently Derek had more to say. 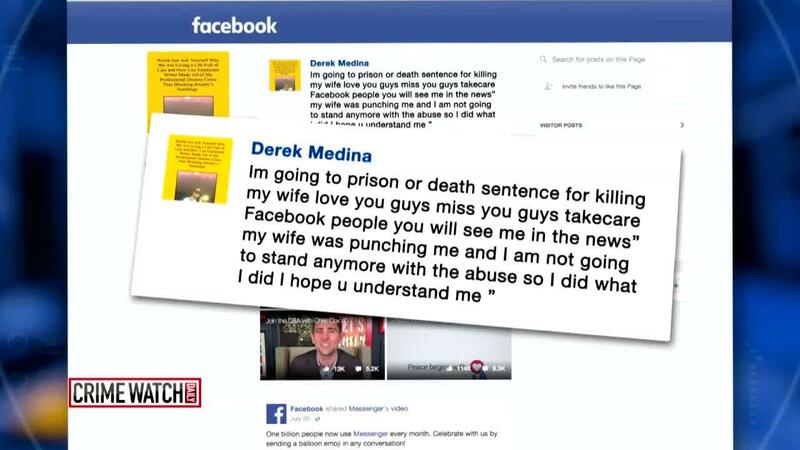 In another Facebook post, he wrote: "Im going to prison or death sentence for killing my wife love you guys miss you guys takecare Facebook people you will see me in the news my wife was punching me and I am not going to stand anymore with the abuse so I did what I did I hope u understand me"
So where is Derek Medina? Reportedly, after killing Jennifer, Derek goes to his aunt's house, then with his father, he surrenders at the police department down the street. South Miami Police Department surveillance video shows the moment Derek Medina arrives. Cops take him into custody and learn Jennifer's young daughter is still at the house, alone, with her murdered mother right downstairs. Cops rush over and bust the door open to get to her. "They find Jennifer's body and then they go upstairs and they find the daughter and they put like a sheet over her head so that she wouldn't see her mom's body as she walked past the kitchen," said Ovalle. With Jennifer's daughter safely out of the house, the focus turns back to Derek Medina. "I'm that killer," Derek tells detectives during a recorded interrogation. "I do not feel that I'm guilty. This was self-defense." Derek says Jennifer started the fight, yelling at him for not waking her up, and began throwing objects toward him "as a weapon." "Towels, mascara, creams. I got hit in the face a few times," Derek says in the interrogation room. Asked if he sustained any injuries at that point, he said no. Surveillance video in the house shows Jennifer alone in the kitchen. Derek follows and they start fighting again. He tells detectives he went back upstairs and obtained his firearm after he was being punched; then he went downstairs, he says, and confronted her. He says she had a knife in her hand. He says he had the firearm in his own hand. Derek tells cops he got the knife away from Jennifer and put it back in the drawer. When asked by the detective, he says she was not armed with any other weapon. "She just started firing punches like crazy, and wouldn't stop again. But she was really like, really attacking me. Like I was getting out of the way, got hit in the arm and she was like going for my temple," Derek says in the interrogation. "I felt like she was trying to just take me out." So after she hit him in the kitchen? "I fired," Derek says. "I fired away, I shot her. From the neck to the stomach." Does he know how many times he actually hit Jennifer Alfonso? "Six to eight times. Everything that was in there hit her, everything that was -- the full round," Derek says. When he shot his wife, did she say anything? "No, she just kept on trying to attack me. She was in shock, she had an expression, like she was shot but she was still trying to swing at me, trying to lunge at me," Derek says in the interrogation. What did you do with the gun after you shot her? "I put it upstairs in the closet again," Derek says. "Then I talked to my stepdaughter, I told her to keep this door closed, don't come downstairs. Then I went downstairs, I took the picture, and then I just locked the door." What did he take a picture of? Was she deceased at that point? Why did he take a photo? "So the family would know and be notified and they can rush over there and get my stepdaughter," Derek tells detectives. What did he do once he took that photo? "Uploaded it on Facebook," says Derek. Detectives ask him about injuries from the fight. He describes bruising and severe pain. He says he was concerned about a life-threatening blow to the temple from his wife. A boxer with a 25-0 record, someone who prides himself on being a tough guy, feels his life is being threatened by a petite unarmed woman. Cops seem skeptical. Why didn't he call 911 from the residence? "Because I figured that I had to solve it on my own," Derek tells detectives. And with that, Derek Medina is arrested and charged with first-degree murder. "If you look at that video and if you watch what happened, the aggressor attempts to lure the other person to keep facilitating the fight, that's what Jennifer Alfonso did here," said Saam Zangeneh, Derek's lead defense attorney. "The murder of Jennifer Alfonso was a huge case in Miami," said Miami Herald reporter David Ovalle. "We've had a lot of bizarre murders in Miami, but this one really was in a different league just because of the fact that Derek put Jennifer's body on Facebook really said something unreal about the digital age." A little more than two years later, Derek Medina goes on trial. "Ladies and gentlemen, the evidence will show that he emptied the clip, eight shots at Jennifer, causing 21 entry and exit wounds," the prosecutor said in opening statements. "And what did he do then? He did what people do when they win -- he told people about it. He took a picture of her and he posted it on Facebook." The defense alleges Jennifer still had a knife in her hand when Derek shot her. "Derek's defense for the trial was he acted in self-defense, and that he was a victim of spousal abuse," said Saam Zangeneh, Derek's lead defense attorney. Zangeneh shows surveillance video from the morning of the murder, claiming that while Jennifer was alone downstairs, she went to the front door, opened and closed it, setting off the sensor to bait Derek to get him downstairs so he would re-engage in their argument. The defense also plays video of another altercation between Derek and Jennifer, suggesting she'd been the aggressor at least one time before. Those images of Jennifer can't compare to what jurors are about see next: A videotaped interview with her 10-year-old daughter, the only other person in the house that fateful morning. She described hearing the fight from her bedroom, then describes the moment cops led her out of the house right by her mother's body. She says the only person in her family that she fears is Derek Medina, because he's "mean to my mom." After more than two weeks of testimony, closing arguments begin. After six hours of deliberations, the jury finds Medina guilty of second-degree murder. Almost three months later, Derek Medina, who did not take the stand in his own defense, chooses to speak at his sentencing. "I will be suing this world. I did not get a fair trial and I will be taking action, I will be suing. Nothing further. 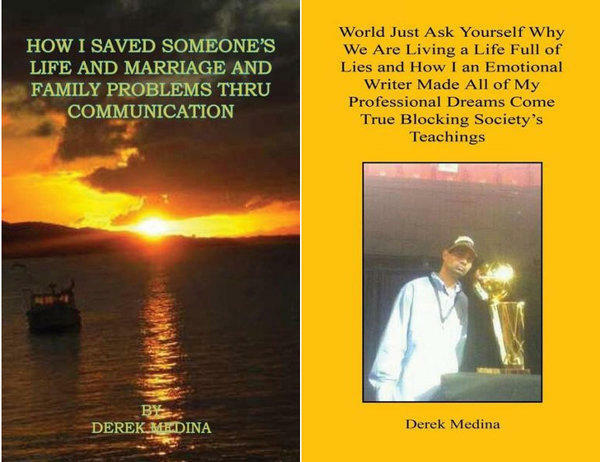 Oh, and God knows the truth, and nothing further," Derek Medina says during sentencing. Medina is sentenced to life in prison. He is appealing his conviction. "There was a substantial amount of evidence that we weren't able to introduce," said Saam Zangeneh. "We had photographs in her phone with regards to satanic rituals. There's a lot of things that we had that we wanted to introduce but the court limited our ability to educate the jury with regards to that." "I think Derek wanted to show the world what he had done, to finally get that attention that he had been craving for years," said David Ovalle. Barring any success with his appeal, Derek Medina must serve a minimum of 25 years before he is eligible for parole. 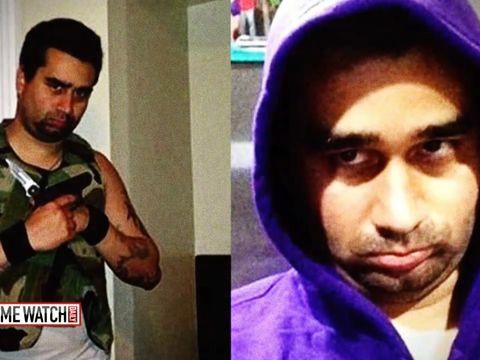 An appellate court has upheld the murder conviction and life sentence of a Miami man who shot his wife and posted a photo of her corpse on Facebook, WPLG reports. The Third District Court of Appeal in Miami rejected claims by Derek Medina that his defense team should have been permitted to put on evidence that he was a battered spouse and that his wife had been aggressive because she was taking pills.